"Art is a calling. It is difficult not to paint. 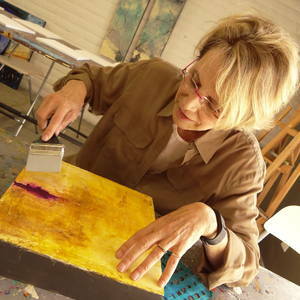 The creative spirit is restless and I find myself heading for the easel... the way some people come home. It is the most authentic career I could choose." "As an artist, I am painting an autobiography of my life—what interests me on any given day—an image, a color, an experience, an object, a movie, a quote…..Some images I keep returning to such as the “door” (opportunity, decisions, changes) the “ladder” (stepping up), “chairs” (support) “hearts” (loving intention) and “cups” (sustenance). Other images come and go, but always color plays a major role." "I love all color, but each time I paint I am drawn to specific colors. Color carries spiritual as well as emotional energy. I like the pulsing, in-your-face, adrenaline-ridden red, the enduring, reassuring, ancient comfort of neutrals and the tender flavors of all the colors that sit quietly in front of me……waiting."